Hastings United’s footballers edged their way past lower grade opposition in the FA Cup this afternoon (Saturday). A first half penalty from Sam Adams gave United a 1-0 victory at home to Thatcham Town in a first round qualifying tie where both teams played the final half-an-hour with 10 men. But it was far from comfortable, particularly during the second half, and the U’s would have been relieved to get over the line on a bright but breezy afternoon at The Pilot Field. After a scrappy opening 20 minutes, United started to keep the ball better and got on top as a result. Zac Attwood couldn’t direct a far post volley on target from a good cross by Sam Crabb and Ollie Rowe’s header from a Sam Adams corner was saved by Thatcham goalkeeper Chris Rackley, who moments later kept out a left-foot shot by Adams at the end of a driving run. United grabbed what turned out to be the winner in the 33rd minute. The referee pointed to the spot following a challenge on Jack Harris - a decision which Thatcham clearly didn’t agree with judging by their lengthy protests - and four days after having a penalty saved against Folkestone Invicta, Adams emphatically blasted the ball into the roof of the net. United looked in control during the remainder of the half. Sean Ray came close with a header from another Adams corner and Jack Harris headed just over from Crabb’s cross, while at the other end, United goalkeeper Josh Pelling just about gathered Marcus Mealing’s free kick at the second attempt. United never really got going in the second half and Thatcham started to pose an increasing threat, particularly down their left. Although Pelling was relatively untroubled, there were certainly several nervous moments in and around the United box. There was a major flashpoint just after the hour. After a lengthy delay while the officials talked things over, United captain Jack Walder and Thatcham player Chris Gerrard were shown straight red cards following a clash in the United penalty area which sparked a melee involving a number of players from both sides. Once play eventually resumed, Rowe lifted one effort just over from a Crabb cross and then headed just over from an Adams corner before making a crucial block at the other end when Ian Davies looked set to equalise from Thatcham’s best chance of the match. United really ought to have killed the game off in the final 10 minutes, but lacked the finishing touch to take advantage of several promising situations. Harris’s goalbound shot after good work by Adams and Bright Temba was blocked near the line by Tom Moran with Rackley beaten, while Kyle Holden was denied by a good save after being played in by Harris. 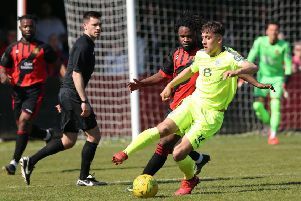 Although it wasn’t convincing, on a day when the likes of Lewes and Burgess Hill Town were knocked out by lower level opposition, United achieved the main objective of securing £3,000 from the FA’s prize fund and a place in the next round on Saturday September 26. United: Pelling, Crabb, Hall, Rowe, Ray, Walder, Adams, Hollobone (Vickers 62), Attwood (Temba 36), Harris, Okoh (Holden 78). Subs not used: Richardson-Brown, Smith, Hanifan, Rose.